Thousands of people across the world this year will be substituting their plush, holiday hotel rooms to go and stay with their friends who have homes abroad. Except the friends won’t be there. Plus, they’ve never even met them before. So what exactly is going on? Vacation Home Exchanges, to be precise. Having been documented since the 1950s, these holiday home swaps have seen a great surge this year what with gloomy the state of the global economy. With belts tightened, people are looking for cheaper ways of taking a vacation, and home exchange provides just that. The basic idea is that you get to go on holiday without paying a single penny for your accommodation. Which basically eliminates your major cost factor. You get to go to an exotic part of the world and have your very own private home to stay in for the duration. In return for what? Well, in return for what could be the slightly nerve-wracking experience of having complete strangers use your own home as their holiday dwellings. 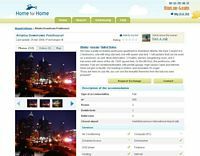 Margaret Poznik, who uses the free online home exchange service Homeforhome describes her family as “adventurous”. Whilst she says that she and her family “can’t recommend this type of travel highly enough” she suggests that it should only be attempted if you feel comfortable with the idea of another family staying in your house and sleeping in your beds for a few weeks. There are some people for whom the idea is just too much. Joachim Walford, who signed up to the same website, decided in the end not to do a home exchange, because he couldn’t quite palette the idea of having strangers taking a snooze on his own bed sheets. This is something that would have been all the more daunting in the past, when you didn’t have the internet-afforded luxury of being able to see photos of your fellow exchangers, chat to them online, and or even have voice conversations over Skype in order to build up a friendship before the exchange. The increase in internet use and quality could explain the spurt in the growth of online home exchange directories this year. High speed internet access has changed both the tools available for doing a home exchange, and the breadth of choice across the world. Gone are the days when home exchange was a limp leaflet with the contact details of some faceless people in an entirely unknown property on the other side of the world. Online home exchange websites not only offer you full colour photographs of the various rooms available in each of the homes, but also instant and easy ways of getting in touch and forming a relationship with the potential exchange partners. Margaret comments that, despite never having met her exchange partners, they “became good friends by email and phone and talked several times before agreeing on the exchange”. So the spring board into the local community that home exchange provides can provide a stimulating and educational experience for children. But for both adults and children alike, the experience of delving right into the heart of a culture, is something unique to home exchange. As Margaret reflects, the opportunity of getting to know the locals and experience some “local colour” was something that a “hotel stay would never allow”. What of the risks? The risks of leaving your home open to a bunch of strangers is the thing that people can find testing. After all, it is your home and your private space, and inevitably there is a certain wariness that comes with opening it up to strangers. However, the cases of problems encountered during a home exchange are very rare. There have been some instances of attempted scams, but most home exchange websites offer advice and have a clear guide-lines on how to interact with other users, which guard against any kind of suspicious activity. At the end of the day, home exchange is a growing phenomenon. In an era where the purse strings are being ever tightened, people are looking for cheaper alternatives to the typical holiday. Now that the internet can offer cohesive, accessible ways of seeing exactly what you’re getting, and allow you to get to know the exchange partners before going on a trip, home exchange is a lot easier and more comfortable than it once was. Sure, it’s not for everyone. But if it tickles your fancy, or if you’re considering an alternative type of holiday, it might be worth looking into as a fun way of saving some cash.